Join the Islington Axe The Act and Holloway campaign groups to demand that the former Holloway Prison site be used for council housing. The authorities are currently seeking development offers for the large plot of land in London and in this time of severe truly affordable housing shortages the last thing London needs is more luxury flats. Following this, also on Tuesday will be the next Grenfell silent march; meeting at 6.30pm Notting Hill Methodist Church, details found here. On Budget Day 22 November The Government will announce where and on what (and on what not) all our money will be spent. We consider this a day of action to pressure our elected representatives to hear our cries for better, safer, secure housing for everyone; to build more genuinely affordable homes; to stop what we consider social cleansing; to save our communities. 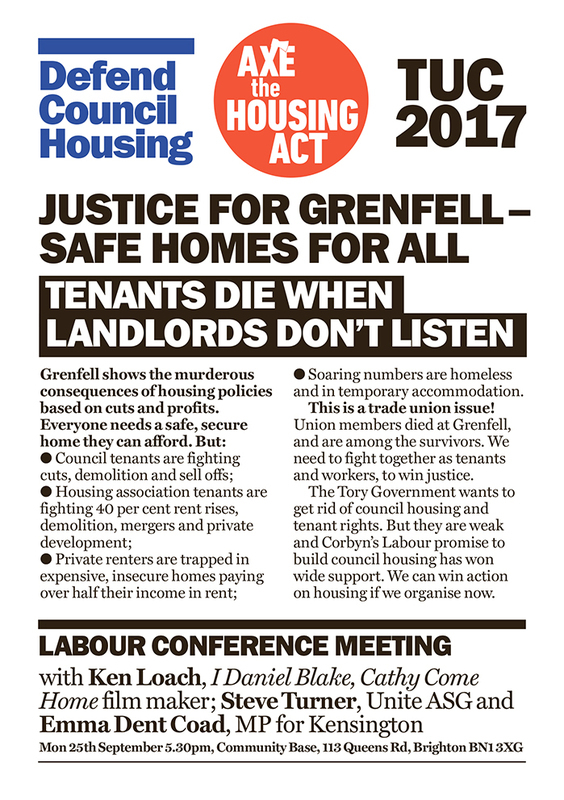 12 Noon at Parliament Square to demand action for homes – spread the word, invite local campaigns and bring banners. 6.30 pm join campaigners and MPs in House of Commons Committee room 17 to hear what the budget does(not) include and what we need to do next. Shadow ministers are among those confirmed. In the lead up to our Homes For All Housing Summit 2017 and as Britain’s housing crisis worsens, politicians from all sides are (finally) seemingly eager to discuss new approaches to Housing. Many of the proposed solutions come no where near to truly fixing the problems at work. We need massive investment in truly affordable, social housing with rent controls for all sectors. 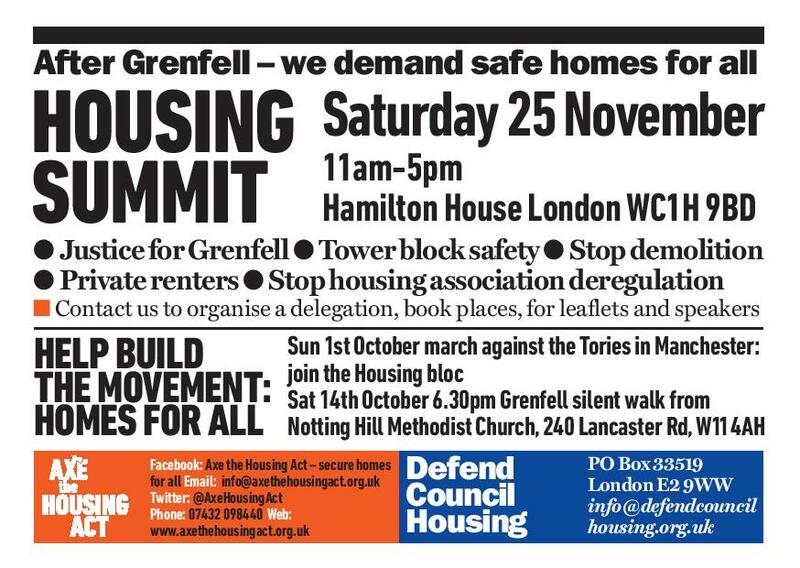 As Government cracks up, housing campaigners are pushing for action on Budget day 22 November, and the national housing summit 25 November. Government housing policy is collapsing. 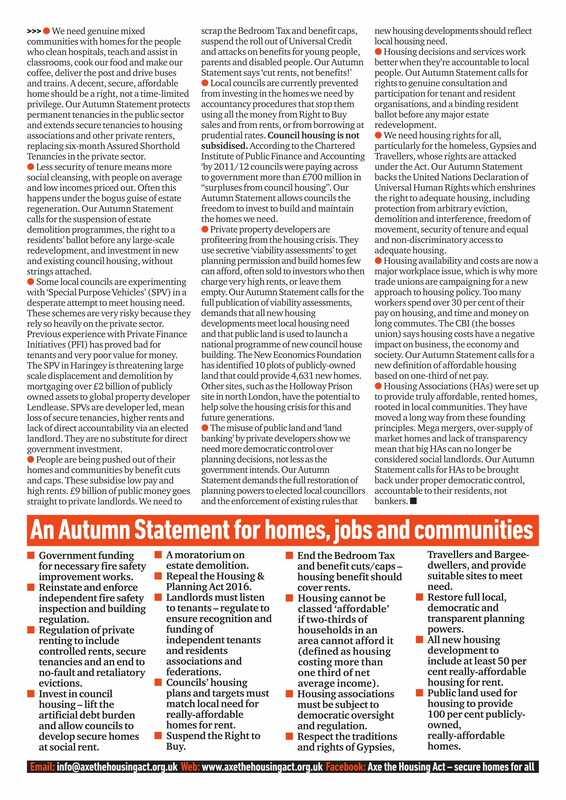 Enforced sell-off of council homes on the open market, and extending right to buy to housing associations, are “policies…no longer showing any real signs of life” says Inside Housing magazine. The sell off of valuable council houses “will be scrapped, not least because it would have required legislation in the House of Commons and given the parliamentary arithmetic that would have been a major challenge” say Sky. We need action on rent controls and council housing, an end to demolition and clearance, an end to attacks and more rights for tenants. That means linking up locally and nationally, getting organised and demanding action. Where we will discuss and outline ideas for our Housing Summit or send updates and suggestions to spread the word and build the action. All welcome. Following on from last years productive and galvanising event – we are proud to announce our plans for a 2017 Housing Summit, taking place this November 25th 2017, at Hamilton House, London. Please get in touch with us if you would like to register an interest in attending or want to help out. Or are you a housing worker or tenants group or organisation who would like to contribute to the summit through discussion or a workshop? We’d love to hear from you. 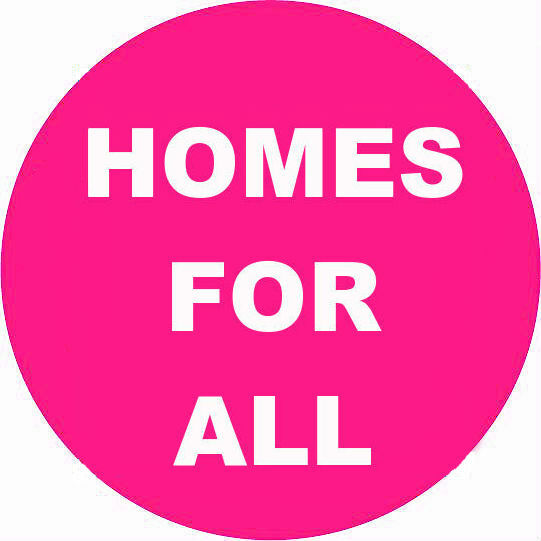 The Homes for All housing summit on 25 November will bring together the growing housing movement, with bookings already from across Britain. Generation Rent (private renters), Hazards campaign and homeless groups are among groups taking part. Lots more details to follow. As the political party conference season comes to a close – there is now a greater recognition from political leaders that Britains housing crisis demands immediate action. Unite offices, 128 Theobalds Rd, London WC1X 8TN. And help us finalise plans for the Housing Summit we are planning on the 25th November. Our fringe meeting at the Labour Party Conference drew 100+ delegates and visitors, many determined to build local housing campaigns. At the conference a resolution was passed calling for more council house building, replacement of any council homes demolished, and a residents’ ballot before any major redevelopment plans. Jeremy Corbyn restated these aims and plans for rent controls, in his high-profile conference speech, and a review of housing building, planning, regulation and management. 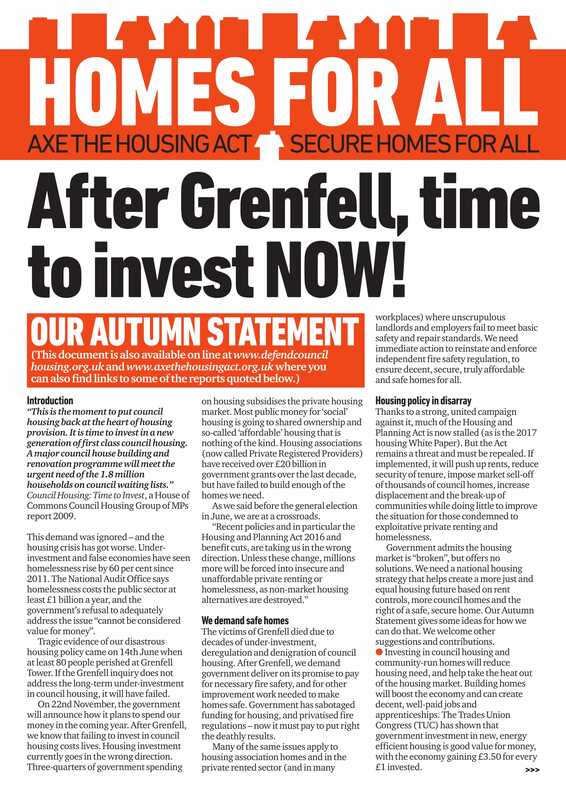 We are launching an Autumn Statement for Homes 2017 to press for action to invest in council homes, regulate housing associations, cut private rents, and Axe The Housing Act. 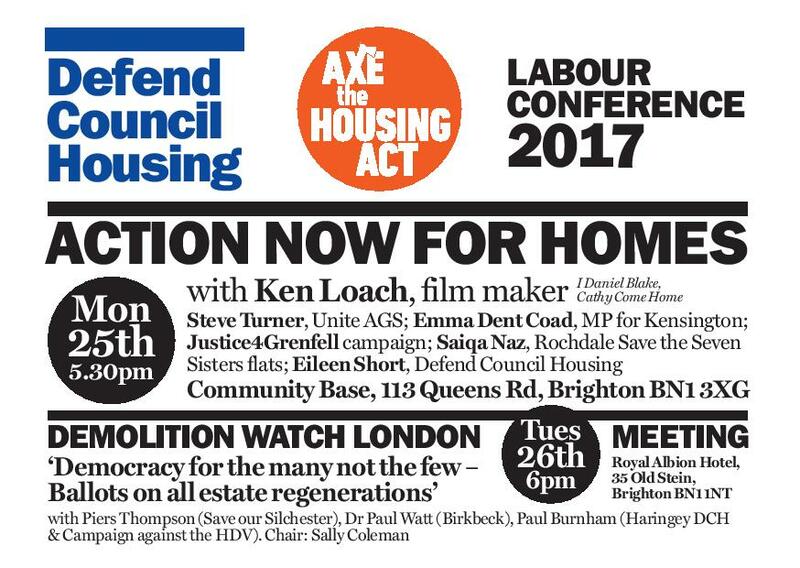 At Labour’s 2017 conference, Axe The Housing Act alongside the TUC and Defend Council Housing will host a meeting with speakers including Ken Loach, Steve Turner and Emma Dent Coad. Also at the conference, a ‘contemporary motion’ on housing calls on councils not to demolish estates. Ask any delegates to prioritise this motion for debate at conference. Sat 24th to Mon 25th: Brighton Leafletting, lobby and talk to those at Labour conference and fringe event. Now is the time to sharpen the weakened Government’s focus on housing. We want commitment to control rents, secure homes for all, and repeal the Housing and Planning Act. We are widening the campaign, to demand action on safety, security, against demolitions and mergers and for the homes we need, as well as scrapping the Housing Act 2016. All are welcome – please pass an invite to other campaigners, and help create a linked up housing movement. Copyright © 2019 Axe The Housing Act.